Summer in Sydney is here (fiiiiiinally), meaning it’s now time to kick back and relax with an afternoon cocktail, right? Right. We’re all about la dolce vita, so we had to take a seat (and a few deep breaths) when we found out that not one, but six, Aperol Spritz bars are popping up all over the city this summer. Now we can finally relax the way the Europeans do—oh, and lucky for you, we know exactly where to find them. 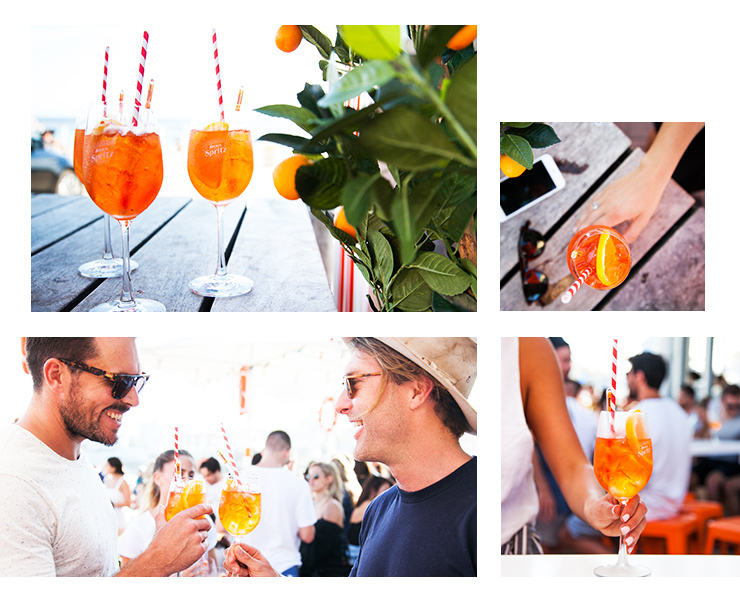 Sunset Sessions by Aperol Spritz will be popping up at The Royal Paddington every. Single. Saturday. during summer. As one of Sydney’s best rooftop bars, it’s the perfect place to unwind, with $10 signature Aperol Spritz, as you take in one of the best views in town (and watch the sun go down). Get all the deets here. Until early January, The Beresford’s courtyard will transform into a Mediterranean paradise, serving Aperol cocktails and canapés every weekend. There’ll be Aperol Spritz, Aperol Spiders and even Aperol gelato for those days when the heat’s just too hot to handle. Get all the deets here. Everyone knows Icebergs is one of the best spots in Sydney for a sunset session, which is why we’re giddy with excitement that Aperol will be popping up with their famous Spritz for the best months of summer, December and January. From Wednesday through Sunday, they’ll be plenty of good time, with DJ Stefano Pierozzi spinning beats til the sun goes down. Get all the deets here. For anyone with hanger issues (that would be us) Gio at Freshwater is where you should be seating yourself this summer. Until the end of April, Sunset Sessions will be popping up on the deck at Gio’s every Sunday. Their mouth-watering 11” pizzas will be all yours for just $16 and, trust us, the only thing that makes pepperoni pizza taste even better is an ice cold Aperol Spritz. Get all the deets here. There’s nothing better than a summer day trip, so it’s time to get the crew out of the concrete jungle and make down south for the ultimate Sunday session. Every Sunday from 2pm, Pepe’s will play host to Aperol Spritz’s Sunset Sessions on the deck, with live music, sea views and the classic Aperol Spritz for only $10 a pop. So spend the morning at the beach, then come by and soak up the last of the afternoon sun. Ends late December. Get all the deets here. Every Thursday for the entire summer (welllll, at least until late Jan), Club Aperol is taking over The Argyle for Summer Essentials. Serving up their classic Spritz for only $10 a pop, leave work early and make the most of the sunshine, kicking back in the glorious courtyard. Get all the deets here. As if things weren’t sweet enough, Aperol in partnership with the Australian Open are giving you the chance to get your hands on (AKA win) tickets to the Australian Open Final (is there anything better than the tennis come January!? Nope.). Plus, you’ll also score a Club Aperol prepaid card and Flight Centre voucher to cover your flights and accom’—you can find all the deets here.